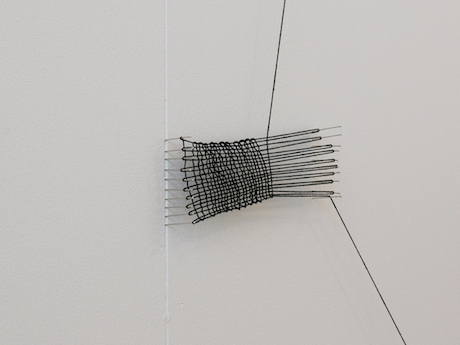 Gillian Lavery, In Progress, Always, 2015, threads and pins, dimensions variable. Image courtesy of the artist. This exhibition comprises numerous small thread drawings, inspired by tapestry weaving and lace making techniques, that wander constellation-like across the gallery walls. This approach to drawing was developed during residencies at the Australian Tapestry Workshop, Melbourne and Textilsetur, Iceland. It was informed by tapestry weaving, darning pattern books and William Kentridge’s emphasis on play and the role of the studio in Six Drawing Lessons.